What has Changed for Angel Tax Exemption as per DIPP Notification. The good news for all recognized startups has arrived ! DIPP has just notified an amendment to its earlier Notification No. G.S.R. 364(E)dated April 11, 2018. under which the procedure for startups to seek income tax exemption on investments from angel funds was fixed. Now the Para 4 of the said notification has been substituted and a new procedure an form ha been prescribed for approval for the purposes of clause (viib) of sub-section (2) of section 56 of the Act. 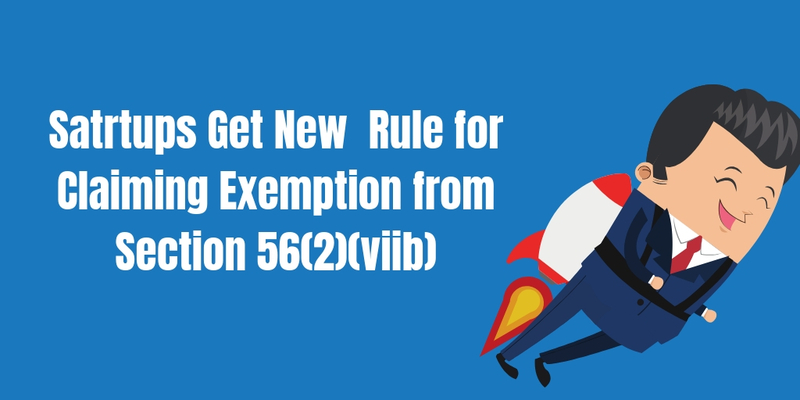 What is the new procedure of claiming exemption from rigor of section 56(2)(viib)? net worth exceeding Rs. 2 crore or the amount of investment made/proposed to be made in the startup, whichever is higher, as on the last date of the financial year preceding the year of investment/proposed investment.So if investor wants to invest Rs 1 Crore ( 10 million) in FY 2019-20, then his/her/its net worth should be exceeding Rs 20 million by 31/03/2019 . How the application should be made ? The startup desirous of getting exemption need to apply in Form-2 prescribed through new notification. The prescribed documents needs to be attached . DIPP will forward the application to CBDT which approve or reject the application with 45 days of receipt of the forwarded application. Approval for the purposes of clause (viib) of sub-section (2) of section 56 of the Act. (ii) The investor/ proposed investor shall have — (a) returned income of Rs. 50 lakh or more for the financial year preceding the year of investment/proposed investment; and (b) net worth exceeding Rs. 2 crore or the amount of investment made/proposed to be made in the startup, whichever is higher, as on the last date of the financial year preceding the year of investment/proposed investment. (ii) The application of the recognised startup shall be transmitted by DIPP to CBDT with the necessary documents. (3) The CBDT, within a period of 45 days from the date of receipt of application from DIPP may grant approval to the Startup for the purposes of clause (viib) of sub-section (2) of section 56 of the Act or decline to grant such approval. 3. In para 5 (1) and 5 (2) after word ‘Board’ words ‘or CBDT’ are added. G.S.R. 34(E).—This notification is being issued in partial modification of Gazette Notification No. G.S.R. 364(E)dated April 11, 2018. 6. This Notification shall come into effect on the date of its publication in the Official Gazette. The Government will carry out a review of this Notification before 31.03.2021. (viii) Issue Price and date of issue-………..
(viii) Issue Price and date of issue of shares (existing as well as proposed)-………..
13. Justification for valuation of shares along with supporting documents, if any. I/We hereby certify that the above information furnished by me is true and no relevant information has been concealed. c. Copies of income-tax return and net worth certificate of the investor for the relevant financial year. 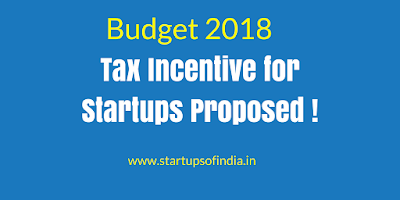 It was already reported on this blog that government amended section 80-IAC Incentive to Startups Proposed in Budget 2018 ! But, as the Finance Bill 2018 was passed, certain changes were made in the proposal. c) It is engaged in an eligible business which involves innovation, development, deployment or commercialization of new products, processes or services driven by technology or intellectual property. The Finance Bill, 2018 proposes that the condition of 'turnover does not exceed Rs. 25 crores' shall be checked in 7 previous years commencing from the date of incorporation. 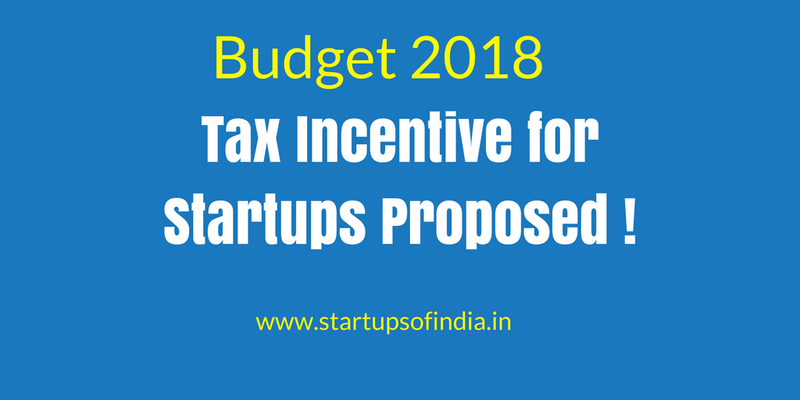 Incentive to Startups Proposed in Budget 2018 ! 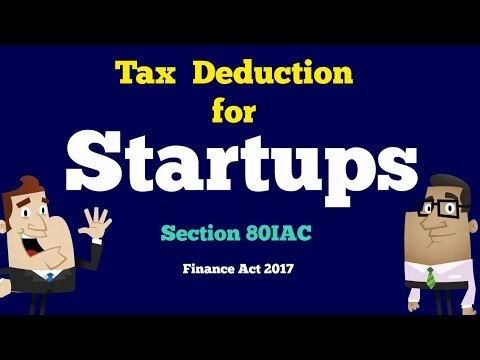 Section 80IAC of the Income Tax Act provides 100% tax deduction to eligible startups under certain conditions. For easy understanding of the provision , a video is created along with FAQ on the deduction provision . 80-IAC. (1) Where the gross total income of an assessee, being an eligible start-up, includes any profits and gains derived from eligible business, there shall, in accordance with and subject to the provisions of this section, be allowed, in computing the total income of the assessee, a deduction of an amount equal to one hundred per cent of the profits and gains derived from such business for three consecutive assessment years. (c) no deduction on account of depreciation in respect of such machinery or plant has been allowed or is allowable under the provisions of this Act in computing the total income of any person for any period prior to the date of the installation of the machinery or plant by the assessee.Explanation 2.—Where in the case of a start-up, any machinery or plant or any part thereof previously used for any purpose is transferred to a new business and the total value of the machinery or plant or part so transferred does not exceed twenty per cent of the total value of the machinery or plant used in the business, then, for the purposes of clause (ii) of this sub-section, the condition specified therein shall be deemed to have been complied with. (4) The provisions of sub-section (5) and sub-sections (7) to (11) of section 80-IA shall apply to the start-ups for the purpose of allowing deductions under sub-section (1).Explanation.—For the purposes of this section,—(i) "eligible business" means a business which involves innovation, development, deployment or commercialisation of new products, processes or services driven by technology or intellectual property;(ii) "eligible start-up" means a company or a limited liability partnership engaged in eligible business which fulfils the following conditions, namely:—(a) it is incorporated on or after the 1st day of April, 2016 but before the 1st day of April, 2019;(b) the total turnover of its business does not exceed twenty-five crore rupees in any of the previous years beginning on or after the 1st day of April, 2016 and ending on the 31st day of March, 2021; and(c) it holds a certificate of eligible business from the Inter-Ministerial Board of Certification as notified in the Official Gazette by the Central Government;(iii) "limited liability partnership" means a partnership referred to in clause (n) of sub-section (1) of section 2 of the Limited Liability Partnership Act, 2008 (6 of 2009). 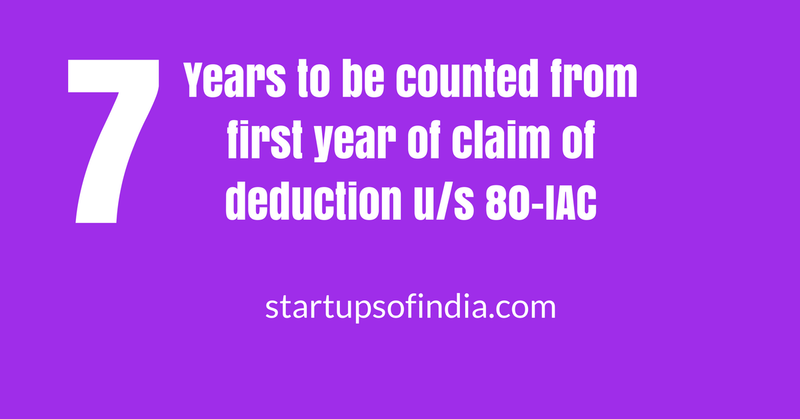 Who can get deduction u/s 80IAC ? Who is eligible startup for tax deduction ? Is that all ? Any other conditions ? it holds a certificate from Inter-Ministerial Board of Certification. 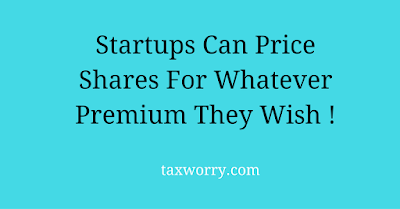 How much deduction is allowable to a startup ? Deduction is 100% of profit for three consecutive assessment years. Startup can select beginning year within first 7 years of starting the business. Who are not eligible for claiming deduction ? 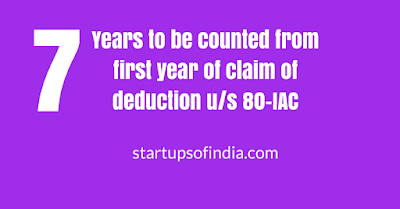 Startup company or LLP is not formed by splitting up, or the reconstruction, of a business already in existence.However, start-up formed due to restructuring of business as per condition u/s 33B is allowed deduction u/s 80IAC. Plant & Machinery is imported . 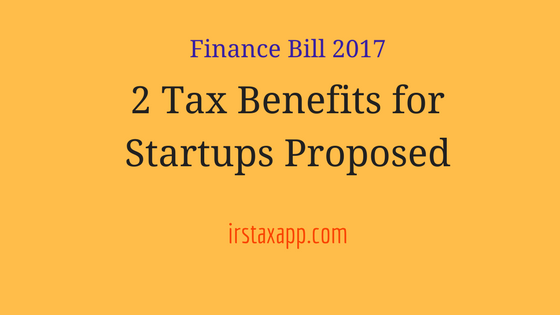 Finance Bill 2017 presented to Lok Sabha by FM contains two definite tax benefits proposed for the Startups of India . The push by this government for setting up startup ecosystem is real and solid. 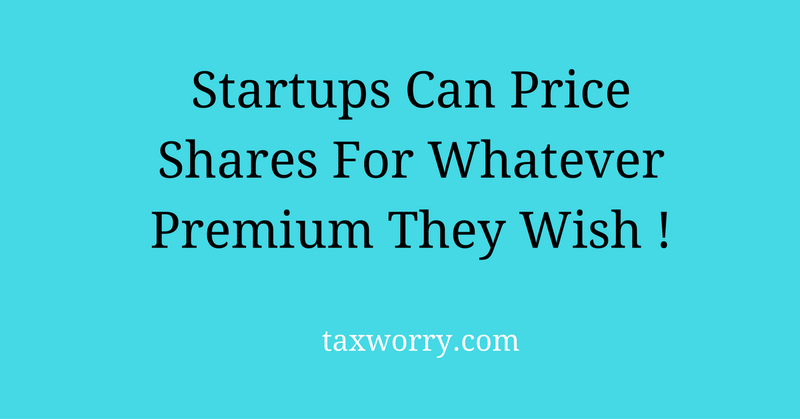 No Tax Issues for Startups Charging Premium on Issue of Shares ! Funding for starstups in India is now unshackled from the tax issues that other private companeis face . Earlier this blog had published Relaxation to Startups on Sweet Equity . Now there is another good news on fuund raising front . The fact that the startups gets funding in the begining more on a vision of a business , rather than on actual result . Most of the startups in the begining incur losses and even from the planning perspective , their brak even years are much later set. So , if in the begining you see the worth of shares of company minus the future or vision of growth in future , the Fair Market Value of each share will be quite low and not even near to the price per share on which the Investors have brought in fundd. This scenario however was raising an income tax issue .